Larry Connors is an experienced trader and publisher of trading research. Together with Linda Raschke, he wrote the book, Street Smarts, which is a solid collection of trading strategies including the Holy Grail. What is so fantastic about the 2-period Relative Strength Index (RSI) that a well-regarded trader like Larry Connors would suggest it as “the one” indicator? Coupling an oscillator with a trend indicator is the usual approach. For instance, Connors recommended the 200-period moving average, and StockChart.com did just that in their RSI2 examples. However, I added a twist to this fast oscillator. Let’s do away with a separate trend indicator, and let the 2-period RSI clue us in on the trend. I always enjoy putting less on my charts. The 2-period RSI (like the 2-period ADX) is extremely sensitive. We expect the 2-period RSI will give many overbought signals during an uptrend. Of course, most of these overbought signals will fail because the 2-period RSI is not meant for locating significant reversals. So, when an overbought 2-period RSI actually succeeds in pushing the market down, we know that a downtrend has begun. Apply the same logic to oversold RSI signals in bear trends to alert us to the beginning of bull trends. To sum up, we look for two RSI signals. The first one to show us the trend, and the next one to show us trade. This chart shows the daily prices of FDX. The lower panel shows the 2-period RSI indicator with overbought and oversold levels set at 95 and 5 respectively. The RSI dropped below 5. That was our signal to look for the last higher high. We marked it with the dotted line and observed it. Price moved up and broke the resistance level. The 2-period RSI oversold signal was credible. Although we did not take this oversold signal, its success confirmed that the market is now in an upward trend. Time to look for a tradeable signal. The next 2-period RSI signal came quickly as it dropped below 5 again. We bought as price gapped above the bullish bar marked with a green arrow. It was an excellent long trade. To clarify how we figure out trend changes in this strategy, I’ve marked out the RSI overbought signals that failed to push the market down in red. These failures are common in a bull trend. However, the last overbought signal circled in black sent the market down below the previous lower swing low. The market bias has changed from bullish to bearish. This chart shows the 6J futures with 20-minute bars and a less rosy picture. The 2-period RSI rose above 95, and we started paying attention to the last major pivot low. 6J fell below the support level and confirmed a change of trend. We began looking for overbought signals for short trades. The RSI overbought signal came, and we shorted below the bearish inside bar. Price stopped out our position within an hour. Compare the price action surrounding the first RSI signal in both examples. The quality of the first RSI signal shows us if the impending trend change is genuine. In the winning trade, the first oversold signal was reliable, and the price rose up to break the resistance without hesitation. It showed great bullish momentum which supported our trade. However, in the losing example, the first overbought signal did not reverse the price immediately. Instead, it rose up further to make a higher high before falling through the support level. This RSI signal is inferior. Hence, the trend change it signaled is less reliable. I had fun with the 2-period RSI. 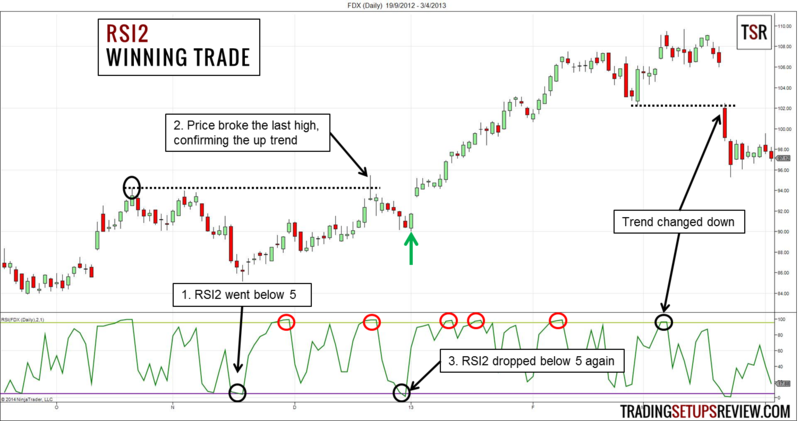 It is an instrumental version of RSI that you can add to your trading toolbox. 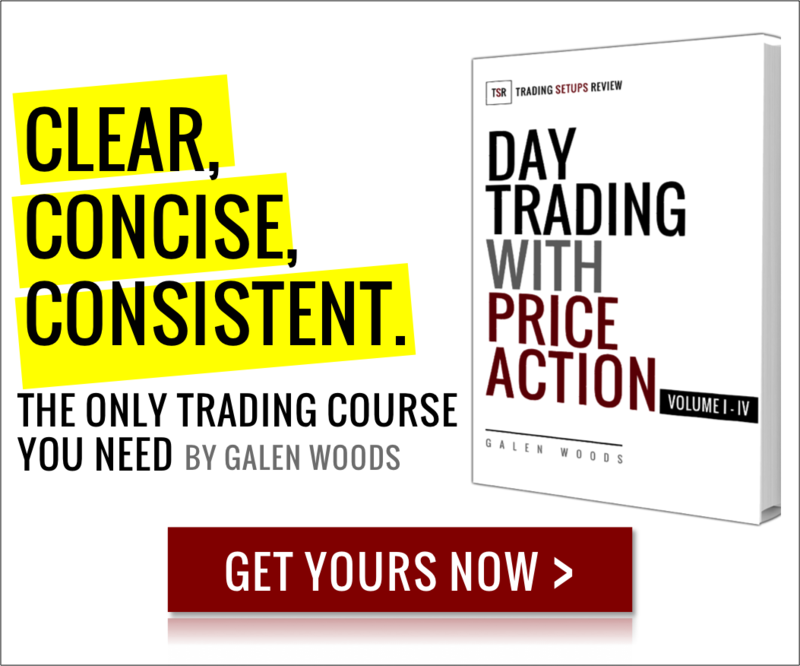 I find value in this trading tool as it highlights where price action gets interesting. The 2-period RSI finds potential short-term tipping points of the market. And according to whether the market tips or not, we form our market bias and get our trading signals. According to our trading rules, we are looking for one strong oversold signal to confirm the uptrend, before we buy the next oversold signal. What this approach implies is that one good trade is more likely to be followed by another good trade. Statistically speaking, we are depending on the serial correlation of successful signals, a useful concept in trending markets. 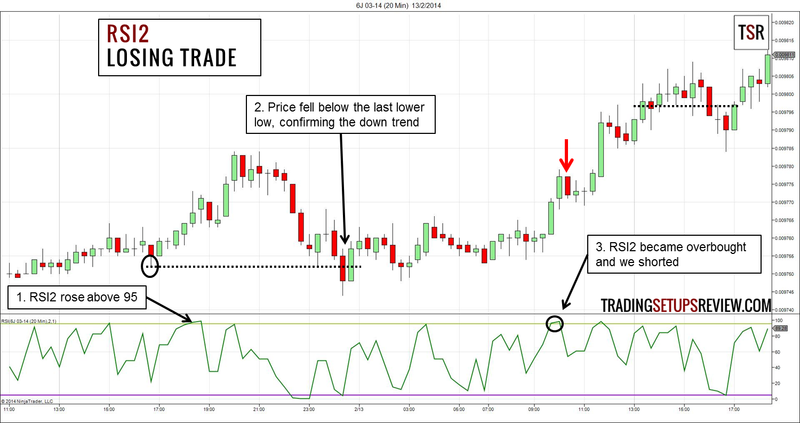 Our method of using the 2-period RSI to find trend changes works best when you are trying to catch the end of a well-established trend. Larry Connors’ research comes with performance statistics. And the statistics of the RSI2 back-testing in his book looks excellent. If you feel tempted to trade it mechanically, think again because the results are historical. However, his book, How Markets Really Work, is a great read. It has back-test results of trading strategies and price action behavior, including highs/lows, VIX, put/call ratio and more. It presents the results clearly in nice tables to show you how markets really work. 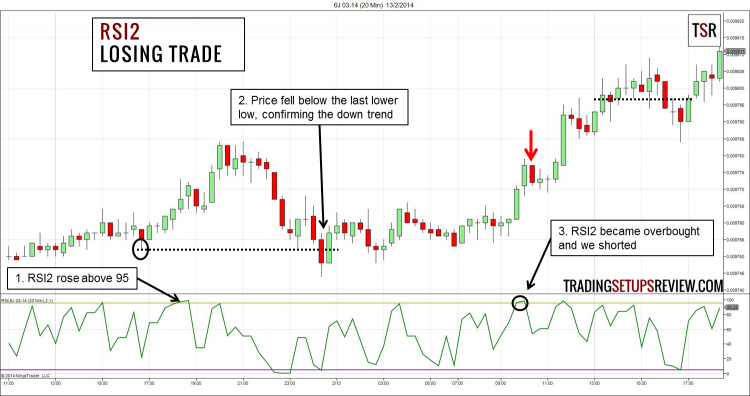 Read it for the complete answer to why Connors recommends the 2-period RSI. Confused by multiple complex indicator entries? Take advantage of this two-bar pattern to simplify your trade entries. Well, I think what worked in the first example was the entry bar was above the price point of the first RSI2 signal, therefore it was “in the direction” of the setup. In the second example, the entry bar was ABOVE the price point of the first RSI2 signal, therefore it wasn’t “in the direction” of the setup and it could have easily been ignored. I agree completely. Thanks for your comment. I pay more attention to swing points in my trading which explains the formulation of the trading rules as above. Your point makes excellent sense. Mmm, I see, though I bet that happens often (price breaking back)…a little retracement before the bigger move. I’d have to backtest to see if that eliminates too many good trades. But what I was saying about the entry trigger bar not being “in the direction” of the setup, agrees also with what you just said partly, because if the price never broke back against the first RSI2 price point, than logically the entry trigger would HAVE to be “in the direction” of the setup. What I like about my little tweak, is, it does allow for some retracement, and inevitable noise, between RSI2 trigger 1, and RSI2 trigger 2 (entry bar). As a daytrader, I find holding fast through pullbacks and other crazy market noise, pays off, and my instinct suspects, that if this strategy does allow for some pullback and re-thrust in the direction of the setup, that it will get you into profitable trades that could have otherwise been negated. But that’s completely just my human instinct, not backtested or even checked against any existing historical data. True. My day trading experience tells me the same, that it pays to hold through some crazy pullbacks. From my observation, price breaking back doesn’t happen much in clear strong trends, which is the market state I am targeting with this approach. Like in the first example, where RSI2 became oversold several times without breaking below previous swing lows. Hi Gale, and also, as I delve deeper into understanding this strategy, can you explain perhaps a little more about how you determine the swing high used before the first RSI2 signal? It says: “The RSI dropped below 5. That was our signal to look for the last higher high. We marked it with the dotted line and watched it closely.” A higher high. Can you put more into context how you determine that? On your chart I can see clearly that before the RSI2 signal that high you circled is the highest high on the chart before that. But I’m sure that won’t always be the case, so how far back do you go, and what constitutes a valid higher high versus an invalid higher high? Thanks Gale, enjoying researching this strategy with you. Once I get an oversold signal, I start looking left and mark out the swing highs before it. Usually, I will focus on the first higher swing high I come across as the resistance to be broken before I adopt a bullish bias. Actually, it’s not cast in stone, but the swing high should be significant. The logic is just to identify a resistance level that if broken, confirms my bullish market bias. Thanks Evan, enjoying it too. Feel free to email me at galenwoods@tradingsetupsreview.com if you want to discuss this further. I like the RSI 2 Period Setup, am trying to understand this method. Hi Galen and thank you for the well-written, insightful article on RSI(2). I was curious if do any programming based on this indicator and perhaps I could share some ideas with you….Please email me. Thank you. Hi Zakk, check your email! Hello! I’ve not programmed this strategy for mechanical trading as I used it to complement my price action methods. You can throw up the RSI2 indicator onto your current charts to see how it might help in your current trading strategy. Thank you for your interest, but I don’t have a video on this strategy right now. This is a video on the basic RSI2 strategy. It’s not the same as the one in this article but could be useful for learning the original RSI2 strategy. Thanks for the set-up and the discussion thread. Insightful. Glad to hear that! Thank you. This SET UP needs the perfect Trade Confirmation with other most best available tools except RSI2… Which can gives you the perfect Entry n Exit from the Trade with…. I’ve tried this setup with ADX 14 above the crossing of Level 25 of +DMI or -DMI along with ADX Line on above. RSI can be consider as the MOMENTUM Indicator and ADX can be consider as the TREND Indicator.. So with these two SetUps the Winning combination is almost 80%-90%. Hi Sumiet, perhaps this article on ADX will be of interest to you.